Your child is grown and, maybe, out of the house. You take a sigh of relief; your parenting is done! While you thought having an adult child would be easy, it is characterized with confusion and frustration when communicating with him/her. You want a relationship with your adult child, but it is more difficult than you thought. The following are a few suggestions to help with developing and maintaining a relationship with your adult child. Do your children want a relationship? The first question to think about is whether your adult child even wants to have a relationship with you. This is an important piece of information to be aware of because you cannot have a relationship with your adult child if he/she does not want one with you. The most helpful thing you can do is be patient. There may be many reasons why your adult child does not want a relationship at this time. It could be a result of hurt or other issues. You should communicate to your adult child that when he/she is ready, you are willing to hear the reasoning behind not wanting a relationship and work on the relationship. Another important question to ask yourself is how the relationship with your child will change due to him/her being an adult. As you know from being a parent, your relationship with your son/daughter changes throughout his/her lifespan. Now he/she is an adult and on his/her own, the way in which he/she relates and communicates with you will be different. Thinking back to your child’s development and his/her current station in life, how do you think he/she will relate to you? For example, if your adult child has always been independent, only seeking your advice when he/she has difficulty in school, you may predict this type of relationship will continue. On the other hand, maybe you were very close with your child as he/she grew up and became an adolescent. Now he/she has gone to college and is married, you have noticed the communication has decreased. In this situation, your relationship with your adult child has changed due to his/her maturity and no longer needing advice like he/she used to. One important change you should notice is your adult child relating to you more as a fellow adult than as a child. This is a change that you want, but may be difficult. While your son/daughter will still need to respect and honor you as his/her parent, as an adult he/ she is now her own person. Therefore, you will have to respect his/her decisions, consequences for his/her decisions, and the lack of control you now have in his/her life. At first, this is a hard transition for some and may take many years to complete. It is important to note that if your adult child still resides in your home and/or you support him/her financially, then you continue to have influence in his/her life. If this is the case, it would be most beneficial for both of you to give your adult child as many opportunities to be independent financially as possible. For example, your adult child should pay for his/her own phone bill, car insurance, and other necessities. If you continue to financially care for your adult child, he/she will struggle to separate from you financially. There is not enough room in this article to discuss this issue in detail. But, the more you can do to help your adult child become more independent from you the better. Whether you are aware of them or not, you have expectations about any relationship in your life. These expectations may consist of the amount of contact you expect or want and do not want. They may also describe the type of interaction you want with that person. In order to have a healthy relationship with any person, you need to identify your expectations of the relationship: whether these are healthy or unhealthy expectations and does the other person have the same expectations. More specifically, realistic expectations are those behaviors wanted in the relationships that are actually reasonable. Whereas, unrealistic expectations are behaviors that are difficult or impossible to obtain. There is no absolute answer to what is reasonable and unreasonable. It is more beneficial to think in terms of what is helpful and unhelpful in the relationship. For example, a realistic expectation for a relationship with your adult child is to communicate with him/her at least once per month. An example of an unrealistic expectation you may have is your adult child is available to talk with you daily. While some adults may be able to talk with their parents daily, most are unable to make this commitment. In order to identify your expectations for the relationships with your adult child, it may take identifying past interactions with him/her. Through identifying previous conversations, you will be able to pick out situations where you felt frustrated or irritated with your adult child, and this can signify a hope for the relationship that was not met. For example, you may have asked all your children to come to your home for Christmas, when two of them stated they would not be able to make the trip back home, you noticed you were very upset. In this example, you may have an expectation that all your children would come to your home for Christmas, as they always used to, but now you have to think of their busy lives and other family obligations they have. While this expectation is not unrealistic, it may need some reworking. Instead of everyone spending Christmas at your home, your hope may be to spend Christmas all together or with one of your children. Therefore, your assumptions for your relationships with your adult children may not be readily identifiable without self-analysis. The last point to discuss is the importance of communicating your expectations to your adult child and listening to his/her own expectations of the relationship. If your son/daughter does not know what your goals are for the relationship with him/her, he/she will have difficulty understanding your motives and meeting these goals. Also, through communicating with your adult child it may help you realize if your expectations are helpful or unhelpful to the relationship. 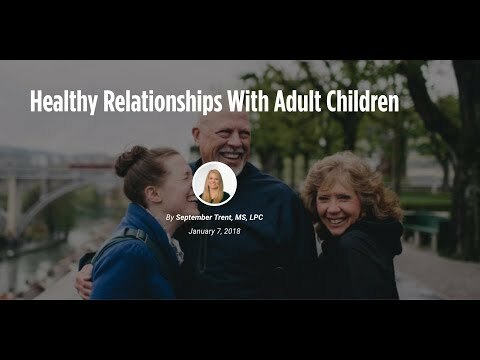 Your adult child will also be able to communicate to you his/her hope for the relationship and the steps they can actually take to meeting the goals of the relationship. For example, you may state to your son/daughter “I thought I could come visit you this summer to see your new apartment.” Your expectation is to be able to see your son/daughter at least one time per year that does not include holidays. Your son/daughter may respond, “Well mom…um…I do not have any vacation time left.” Your son’s/daughter’s expectation may be to see at least once per year. Therefore, both you and your son/daughter would need to communicate your expectation or goal in visiting one another and identify an action that is realistic for both of you. Earlier in the article, I briefly discussed the lack of control you have as parents when your children are adults. This may be obvious to some. Others may unconsciously behave in ways toward their adult children in order to maintain control. For example, you may notice yourself becoming upset or even angry when your adult children ask for your advice, but do not follow it. It would be important for you to analyze where the anger is originating: concern for your adult child, trying to control him/her, or entitlement to have a say in his/her life. You no longer have control over your adult children’s lives, unless they depend on you financially or if their actions directly influence you. If your adult children still depend on you financially, then you have a say in the way you assist them financially. For example, you have a choice of whether to pay their phone bill or not. If you are continuing to assist your adult children financially, it would help to take opportunities to allow your children to be responsible with earning, spending, and saving money. On the other hand, if your children’s decisions are directly influencing you, boundaries may need to be set. For example, if your child is living with you and he/she is not actively trying to find employment, you may need to state he/she will need to pay rent in a designated period of time if he/she has not found employment. Therefore, as a parent of an adult child, it is important to remember you no longer control your child. At this point, you have the opportunity to view the result of your hard work as a parent to produce a (hopefully) responsible adult. If you find yourself needing or trying to control your adult child, it may be time for you to look at ways to work on these issues. While the following is not an exhaustive list of characteristics of a healthy relationship, they are a few helpful suggestions. A healthy relationship is impossible without both parties in the relationship feeling some sort of safety toward the other. Safety in a relationship can be defined as both parties taking into consideration the other’s thoughts and feelings, encouraging communication about these, and making decisions that respect and consider all opinions. If your adult child does not want a relationship with you, it may be wise to examine if your child has felt hurt by you in some way which is impacting the safety in the relationship. Safety does not simply happen; it is developed and maintained. If you feel the safety in your relationship with your adult child is absent, communicate to your adult child your willingness to work on safety in the relationship and brainstorm ideas for rebuilding safety within the relationship. Two other important characteristics of healthy relationships, which coincide, are to listen and reflect when speaking to your grown child. As you may guess, safety is the prerequisite for being able to listen and reflect in a relationship. When speaking with your son/daughter ask yourself: Have I really listened to what he/she is saying? Do I understand what he/she is trying to tell me? It is imperative that your two objectives when communicating with your adult child are to listen and understand. To help you with these tasks, reflecting what you hear will help you check with your adult child if you have heard and understand him/her correctly. If you have never communicated in this way before, it may take time to communicate with the above goals in mind. However, you will see an improvement in communication when your goals are to listen and understand. You may be wondering why “space” is included in characteristics of healthy relationships. It is included because, especially with adult children, you need to give him/her space to make her own decisions and no longer be dependent upon you. You may want to communicate until the problem is solved. However, your son/daughter may need to time to think and make his/her own decision. In actuality, giving your adult child space will improve the safety and quality of your relationship with him/her. Remember as discussed earlier, you no longer have control over his/her decisions. When you try to exert control, your adult child will pull away from you. Whereas giving your son/daughter space, will allow him/her to feel safe to ask for help when needed. Navigating the many stages of parenting is hard! While your job as a parent may be over, maintaining a healthy relationship with your adult child is not. Analyzing your relationship with your son/daughter will be beneficial to you. It will also be beneficial in promoting and modeling how to have a healthy relationship. If you or someone you know is struggling with developing a healthy relationship with adult children, contact My Counselor Online. We know how to help! Learn about how our counseling services work and how to start the process. September Trent MS, LPC is a licensed professional counselor specializing in eating disorders, self-harm, anxiety, and depression treatment. You can schedule an appointment with September for online counseling or in-person at our Springfield, Missouri counseling center.